Emmett Blois Assists Loveita & Kelsey in a Poker Chip Hiding Competition! 6pm Emmett, Loveita and Kelsey are in the house. Loveita and Kelsey have poker chips that they have to hide around the house. Loveita has black poker chips and Kelsey has white poker chips. Emmett comments on some of their hiding spots asking them if they want to lose this competition. They have 10 minutes to hide all their poker chips. (Soon the house guests will enter the house and tear it a part to find the poker chips. Who’s ever poker chips the house guests find more of will lose the competition. Big Brother Canada 2 – POST Finale Interviews, Photos, and MORE..
Last night on the finale of Big Brother Canada 2 the winner Jon Pardy was crowned by a vote of 6-1 and took home the grand prize of $100,000, $25,000 gift certificate to the brick and a $10,000 vacation sponsored by Twistos. Sabrina Abbate took second place and left with the second place prize of $20,000. 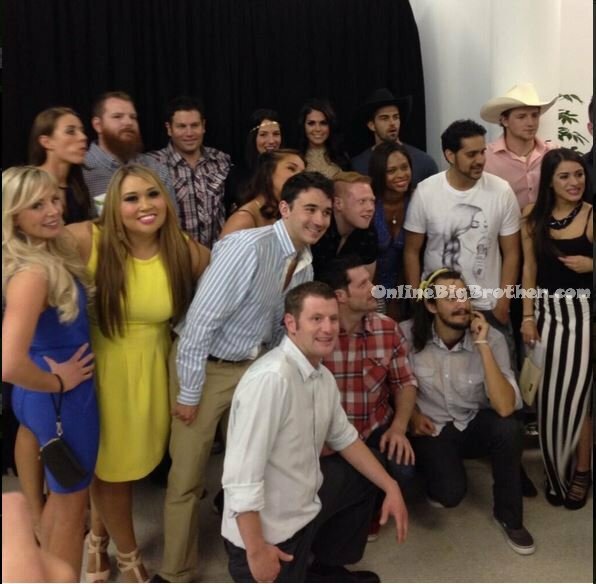 The visually bitter Neda Kalantar walked away with only regrets and disappointment in not being the one to have been able to cut Jon had she beat him in the final part of the 3 part HOH competition. After almost a week since the Big Brother Canada Finale episode the house guests have been reunited for the ET Canada Reunion Special. The special reunion was hosted by ET Canada’s Roz Weston where he interviewed and spoke with all the house guests. Roz speaks with the season 1 winner Jillian about how she won the grand prize, as well as with Topaz where she explains what happened and how despite the mix-up runner-up Glitter Gary gracefully took it all in stride. In addition, Roz also puts Alec and Emmett in the hot seat when he shows their showmances Topaz and Jillian footage they hadn’t seen before. Big Brother Canada: The Morning Show – AFTER the Finale! Is GARY okay with SECOND PLACE? Love it or hate it, the events that transpired on last nights Big Brother Canada Finale Episode could not have be predicted. There is only one rule to Big Brother and that is to EXPECT THE UNEXPECTED and that was surely what happened last night. With a SHOCKING Big Brother Canada FINALE episode last night, everyone is wondering what the house guests are thinking about conclusion of season one. Last night’s 2 hour finale episode was filled with surprises and jaw dropping moments. First the season front runner Emmett was evicted by the final HOH winner Gary and then by some insane mix up Topaz mistakenly voted for Jillian to win when in fact she wanted to vote for Gary. The shocking reveal of the votes by host Arisa Cox will go down in Big Brother history as one of the most unbelievable mistakes that ultimately cost Gary the Big Brother Canada Grand prize. 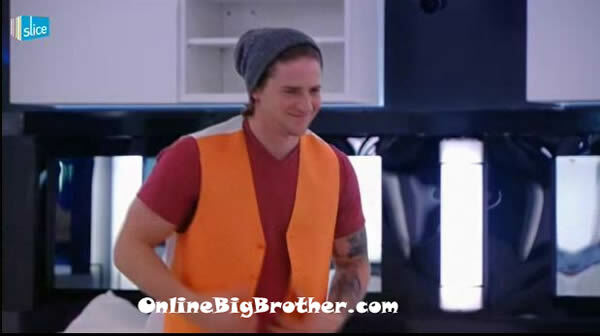 Tonight airs the May 2nd, 2013 – 28th Episode of Big Brother Canada. As it stands before the Big Brother Canada Live Feeds were turned off, Jillian WON the second to last Head of Household power and nominated 21 year old GARY LEVY from Toronto, ON, and 26 year old TALLA REJAEI from Edmonton, AB. During the Power Of Veto Competition Emmett WON, securing his position along with Jillian in the Final 3. On tonight’s episode we see the Power Of Veto competition that Emmett won and watch the results of the EVICTION, where Emmett casts the sole vote to evict either Gary or Talla. Emmett says they’re building something, MY LUCK they DQ’d me again and its another POV! 12:15pm – 12:30pm Emmett heads up to the HOH room. Emmett talks about how he doesn’t know what’s going on and want the POV ceremony to happen already. Jillian says maybe its this evening. Jillian tells him not to worry you are fine! Emmett heads back down to sit on the kitchen couch. Emmett comes into the main bedroom and tells Gary that they (big brother) is building something in the backyard. I hear banging. Emmett asks Gary what normally happens with final four. Gary says final four is normal. So something special is happening. Emmett leaves to go up to the HOH room. Emmett says my luck they DQ’d me again and its another POV! Jillian sasy then we would just win it again and piss them off. Emmett says how do we know they aren’t going to take it away from me. Jillian says then it would just go to the next person which is me. Jillian asks Big Brother to reassure Emmett so that he doesn’t have a heart attack. Big Brother Canada MYSTERY Why was Talla awake before everyone else and why was she happy? 8am Big Brother wakes up the house guests by turning on the lights. Emmett and Jillian immediately wake up and start moving around the house. Emmett heads downstairs and notices that they are on an indoor lock down. He heads over to the back door and tries to listen to see if he can hear anything going on. He sits on the kitchen couch. Jillian comes out to the HOH room balcony and asks Emmett why they are on lock down .. is it for Part 1 of 3 HOH? Emmett says no. Jillian gets told to put on her mic and so she goes back into the HOH room. Emmett sees Talla come out of the diary room and asks her how long she was in there for. Talla says awhile, before you guys got up. Talla says she is going back to sleep. Gary then heads into the diary room. Emmett goes to the bathroom. Gary comes back and joins him and says that he has to do a diary room session. Jillian joins them. Talla: “HI Henry.. Oh how did I do ooh.. well I thought I had to created a equation to get a f*ing answer..
Big Brother Canada Nomination Ceremony Spoiler RESULTS! 1:45pm – 2:10pm The Big Brother Canada Live Feeds come back on from showing the hush hush screen. Emmett and Gary are in the main bedroom. Emmett asks Gary if he knows where a piece of clothing of Jillian’s is. Gary says I don’t know where that b!tches clothes are at! Emmett tries on Gary’s Ralph Lauren yellow and white vest. He asks Gary what he thinks. Gary laughs and says no .. you look like dumb and dumber. Emmett laughs at how Gary is now using 4 of the trunks for his clothes. Emmett leaves the room. Meanwhile in the kitchen Talla and Jillian are playing puck ball. Gary comes into the kitchen and makes a slop shake. Emmett goes back to the bedroom and paces back and forth. Jillian says Emmett said I don’t want to hear another word out of your mouth you piece of sh!t! 8am – 8:30am Big Brother wakes up the house guests. They start getting ready for nominations and then the live feeds are blocked. 9:20am – 10:15am Still showing the hush hush screen. 10:15am – 10:20am When the live feeds come back Talla is in the kitchen cleaning. The camera flashed to the storage room where all of the memory wall photos have been taken down. (The Power of Veto competition will most likely have something to down house guests faces or past events.) Meanwhile, Emmett is out in the hot tub room walking back and forth mumbling the past events of the house. He is studying the past events of the house for an upcoming competition. Emmett heads back in to the backyard. Gary is in the hammock. Emmett asks Gary does she (Talla) seem worried? I’ll talk to her again. Gary says I don’t think she is worried at all.